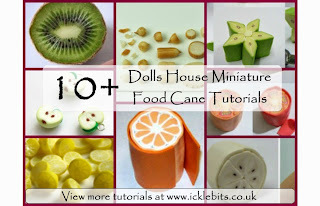 I've been updating the site with dolls house miniature tutorials for fruit and veg this week. Whilst I've been looking for them, I found some great fruit and veg cane tutorials. I have put some together for you to look at and try. Please click here to view the tutorials on my website. In the 10 years I've been making miniatures, I'm yet to make a kiwi! I am putting together a pinterest board for tutorials. To keep up to date with them before they get added to articles on the website, please click here and follow. Visit icklebits's profile on Pinterest.